Our training rooms are set up with everything you need for your training courses. Speedy internet, training equipment and free refreshments are all included to ensure you get the best course possible. Our comfortable training rooms are conveniently located 9 minutes walk from Glasgow's Central Station and opposite both the Hallmark and Marriot hotels. Handy for transport - and with parking just across the road. Our IT suites are perfect for any computer training course. We supply comfortable IT suites in various sizes up to 24 people, and your software and documents can be ready for your arrival. Looking for a good place in Glasgow to host your next training course? A spacious, dedicated and professional training venue with comfortable serviced training rooms and IT suites for hire - all within a distinctive and accessible location. Training within Glasgow Training Rooms, handily located within the Pentagon Building in Glasgow's city centre, means having affordable access to everything conveniently already set up to ensure your ideal training session. Facilities include IT classrooms and meeting and training rooms that can be rented by the day (or by the week, or by the month or for bespoke periods). These are typically set up with central tables for good group interactions - or are classroom-style with everyone facing and focusing on presenter and screen. All rooms for hire have large-screen or projector-based presentation equipment and super-strong internet connections. As standard, each training space has unlimited in-room refreshments, with attentive on-hand staff to help with hospitality, operations and technical support. Every hire also has free use of a presentation laptop and the included Wi-Fi is dedicated to each room and directly linked to dedicated top-end Hyperoptic internet (which is available wired too if preferred ). Every attendee also has access to shared spaces, plus on-site cafe and catering. This also makes hired rooms ideal for meetings and day-conferences, for which we can also provide speakerphone facilities too. We also welcome inquiries for rooms for your own equipment, or particular needs, or possible layouts. 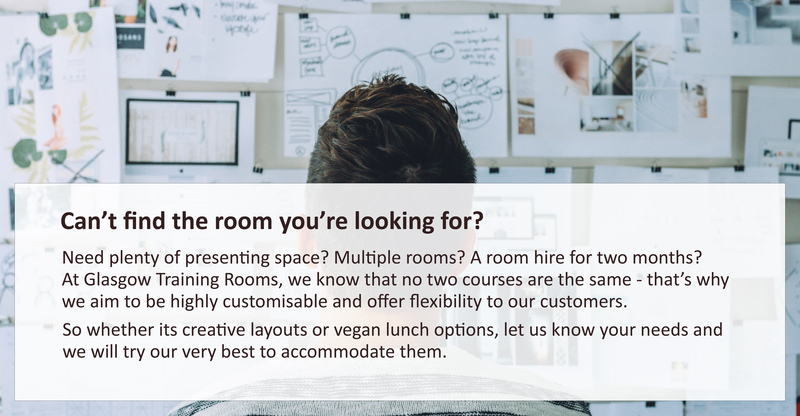 As a local Glasgow company, we have years of experience of providing high-standard rooms - aimed to feel to all attendees just like your own well-equipped and staffed Glasgow Training Centre. Training rooms can be booked for any size ranging from small groups to classes of 24 trainees plus instructor(s) all with seats and desk space. Contact us to let us know what you might ideally like or call on 0141 303 8430. Our training rooms are all well-furnished and fully-equipped with everything you need for a productive learning session. Rooms can accommodate any size of class from 2 to 24 people, and on-hand staff are available to ensure your event runs as comfortably as possible. Our IT suites offer business-class computers perfect for use in software and internet training courses. Each computer is equipped with Windows, Microsoft Office, and super-fast 100MB Hyperoptic broadband. An IT specialist will always be on hand to help and computers can be set up with your own software in advance if requested.